GEOPIER® soil reinforcement and improvement solutions are intermediate foundation techniques that are alternatives to the traditional solutions of excavation and soil replacement, structural fillings, foundation shafts and preloads, which take a long time to achieve their effectiveness. They are the result of continuous development and research to provide foundation and settlement control solutions on soft and compressible cohesive soils. 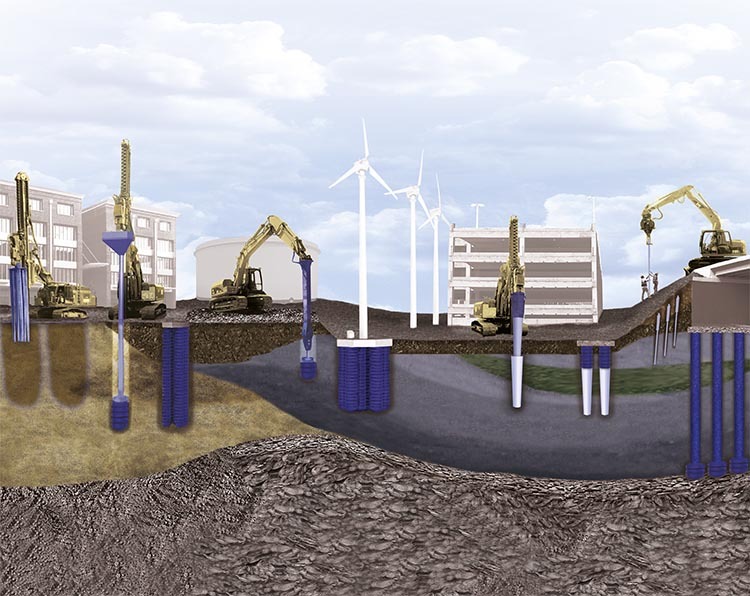 GEOPIER® systems provide significant increases in the permissible soils bearing capacity or limit the settlement of supported structures in accordance with project requirements. They are constructed by replacing and/or displacing the soil in successive compacted layers of gravel aggregates using specially patented tools to apply high vertical compaction energy, high frequency and low impact amplitude, thus achieving high internal friction angles (>50º) in the compacted aggregate and higher rigidity modules than those obtained with vibration techniques. The action of vertical compaction increases the lateral pressure and improves the capacity and shear resistance of the surrounding soils, resulting in an over-consolidation of the soil around each Geopier, which together with the high rigidity of the element allows effective settlement control. For very low stiff and highly compressible soils, where the lateral tension is not sufficient to contain the compacted aggregate column, rigid inclusions solutions have been developed using very high modulus of stiffness elements for settlement control, based on the use of cement/concrete mixtures. In all cases, GEOPIER systems make it possible to reduce execution times; they are quick and safe solutions with high quality control, the results of which are verified with static load tests to check the column rigidity module and guarantee the settlement estimated. The success of the system is supported by the thousands of projects carried out around the world over more than 30 years.